This Program takes up where 'Beginning Bluegrass Banjo Vol One' leaves off. Includes: study of tunes in the Scruggs, melodic, & single-string styles. Also explains use of the capo & How to play tunes in the G, D, & C positions. Tunes include: Fireball Mail (two variations: regular & up-the-neck), Old Joe Clark, Devil's Dream, Soldier's Joy, & Sweet Dixie (Home Sweet Home) * accompanying tablature sheet music inside this package -------------------------------------------------------------------------------- About Greg Cahill Greg Cahill has Grammy nominations for one of his Banjo LPs, & several LPs by his Bluegrass Band, 'The Special Consensus'. He has recorded & performed with the likes of Jethro Burns & Byron Berline, & his playing can be heard on countless major radio & TV commercials & on recordings of various Country, Folk, & Bluegrass artists. If you�ve seen a TV commercial featuring John Lithgow (from the hit TV series 'Third Rock from the Sun'), with a banjo, that�s actually Greg Cahill doing the playing! 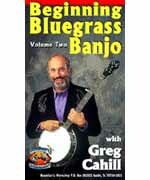 Greg has been featured twice on the cover of 'Banjo Newsletter' & appears periodically as a guest columnist. He teaches at 'The Old Town School of Folk Music' in his hometown of Chicago, & conducts workshops at music festivals & venues nationwide & internationally. He has toured with his band all over the U.S. and Canada, South America (Argentina, Chile, Uruguay), & Europe (England, Finland, Germany, Holland, Ireland, Scotland, Wales and Switzerland. Greg is on the Board of Directors of the International Bluegrass Music Association (IBMA), & is chairman of the IBMA 'Bluegrass in the Schools' committee.